Once a long time ago, I crashed a Halloween party. Sounds very bold, doesn’t it? But truly, it was out of character for me, and besides, I was in costume so in a way the person who crashed the party wasn’t really me. I remember that the party was given by a friend of a friend, but I have no idea how or why I decided to go — perhaps as a joke to see how long it would take for people to realize they didn’t know me. I dressed as a witch — the whole bit: long black scraggly hair, puttied nose and chin almost meeting, heavy black brows, green-tinged skin, cackling voice. I walked into the party as if I belonged there, and for a while I was the belle of the ball as people tried to guess who I was. It finally occurred to one guy that I was a total stranger. So I left. Rather hurriedly. That’s how I feel now as a science fiction writer — as if I’ve crashed a party, and no one has yet discovered that I don’t belong. But am I a science fiction writer? 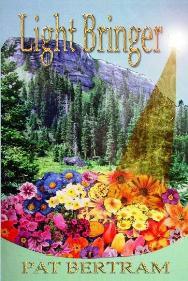 Light Bringer was written as a thriller, not science fiction, though readers have called the novel science fiction. The story t akes place in the present day, not in some fantastic future or otherworldly setting. The characters are recognizably human. Most of the science is based either on what is known today or gleaned from ancient religious documents and mythology. There is more history than science. And yet, a couple of my characters are not quite human, there is talk of UFOs and of another planet in our solar system that might return to wreak havoc upon earth. And, more importantly, Light Bringer is about ideas, showing us humans in a different light. Do those few science fiction elements make my thriller science fiction? Will calling it science fiction give people the wrong idea about the book? People like what they recognize. There are certain conventions that readers expect in their favorite genre, and they are unforgiving if their expectations are not met. What if they decide I’m only masquerading as a science fiction author? And so here I boldly stand, acting as if I belong, but secretly wondering if anyone will guess that I am a stranger in a strange land. Each book has its own demands, and Light Bringer had more demands than most. It was the only book I did a storyboard for. Halfway through, I got lost in all the points of view, the various stories that needed to be intertwined, the special needs of the novel, so I wrote a brief description of each scene on a card and played with them, dealing them out in various arrangements until I found the best way to fit all the pieces together. Light Bringer was also the only book I did a character chart for. The story was based on both modern and ancient conspiracy theories (though ancient conspiracy theories fall under the category of “myth”). Instead of having one erudite character lecture a clueless character on the theories, I created a discussion group where each character believed and vociferously defended his or her pet theory. One unexpected benefit of the group was that I had ready-made pool of characters to draw from for bit parts. Group dialogue causes problems for readers in that it’s hard sometimes to keep track of who is talking and what their purpose is in the story. It’s also hard for writers to keep track, so I made a chart of all the characters, their beliefs, style, food needs, and various other aspects to make sure that each was different. For example, Scott Newman, a retired banker, believed that the international bankers were controlling the world to gain total wealth and power. He was lean, sharp-featured, contemptuous, didn’t eat “corporate foods” (things like chips and frozen dinners that were created by corporations) because as a loan officer, he’d already done enough to further the aims of the international bankers. Faye Pozinski was almost his direct opposite. She believed that the British oligarchy (London bankers, the London School of Economics, the Fabian Society, the Rhodes Round Table) were controlling the world to create a neoBritish empire ruled by a theocratic world king. An ample woman in her fifties still working as a grocery clerk, Faye was hearty with a braying voice, a vegetarian, and delighted in wearing wildly colored clothes. And then there was Chester, a wizened, jeans-wearing diabetic fruit grower who overdramatized everything. He’d once seen a UFO above his orchard, and he believes we are ripe for an alien takeover because he’s convinced these otherworldly creatures want to keep us from blowing up the earth. These are only three of my discussion group characters but you can see why I needed a chart. So much to keep track of! A fellow writer took exception to my comma usage in the opening sequence of Light Bringer. I double-checked the first page or two of the book but couldn’t see anything to change. I know I used a lot of commas, but each one was painfully earned. While writing and rewriting the novel, I would take them out, agonize over them, then put them put them back. The next day I would repeat the process all over again. There are many rules for comma usage, the main ones being to use a comma between all terms in a series, before the conjunction when joining independent clauses, and to set off parenthetical remarks. I do not need to give you examples; you probably know more about commas than I do. But despite all the rules that have been formulated for commas, there is one overriding rule: use a comma to prevent confusion. In other words, follow the rules until you can’t follow the rules. Clarity is more important than any punctuation rule. Beyond clarity, the commas in Light Bringer were used for pacing. I could have used short sentences at the beginning, but short sentences evoke action, and someone driving at night on snowy, unplowed, unlit roads would not be moving quickly. I could have used run-on sentences, but they have a breathless quality, and also seem to evoke speed. Again, not what I wanted. So what I was left with was commas. A lot of commas. Maybe I really should take some out. Or not. Helen Jenks gripped the steering wheel and squinted into the darkness beyond the beam of the blue Volkswagen’s headlights. Nothing looked familiar. Was she almost home? The snow had stopped falling, but in these hills so far from town, the county didn’t bother to plow. She didn’t know if she drove on the right road, or any road at all. There were no other cars, no tire tracks. An odd drone caught her attention. She held still and tried to isolate the sound from the rumble of the Volkswagen engine. Was something wrong with the bug? Oh, please, no. She sat back and rotated her head to ease the stiffness in her neck. Maybe it was Venus. Hadn’t she read that at certain times of the year, under certain conditions, Venus could be as big and as bright as the moon? When at last she parked in front of her old frame house, she pried her fingers off the steering wheel and stumbled out of the car. Except for the dings and pops of the cooling engine, the world was silent, appearing so new and untouched, she hesitated to mar the opalescent expanse with her boot prints. Then her eyebrows drew together. The snow wasn’t untrodden after all. Tracks led to the house where a small gray creature huddled against the door. 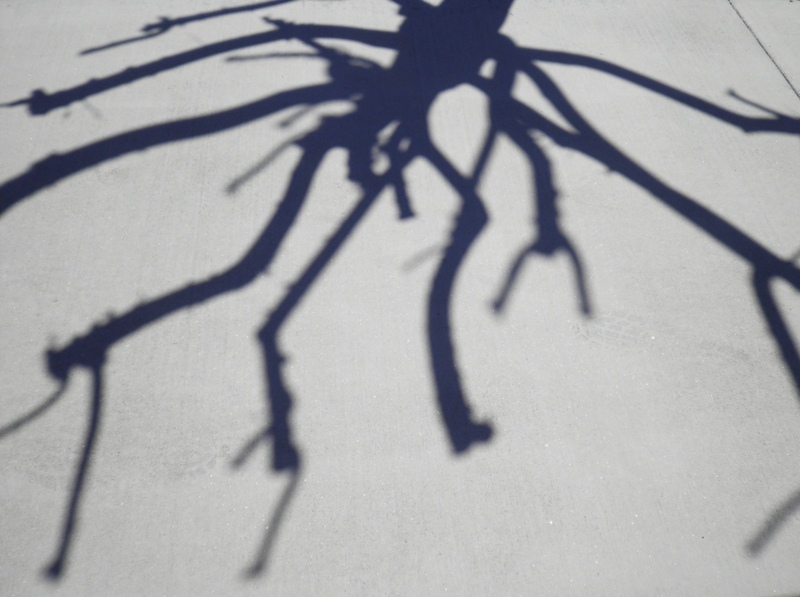 Out walking the other day, I noticed an incredible shadow of a tree on the sidewalk, and I had to stop and take a picture. I happened to pass at just the right time. In a few minutes, the sun would be in a different position, clouds would filter the sunlight, and the lines of the shadow would blur. But for just a moment, there it was — stark and beautiful. Since I happened to be carrying my camera, I am not the only one who saw that shadow — you can see it, too. During my two years as a published writer, I learned that if you wish to be a selling author, you need to pick a specific, recognizable genre, and you need to develop a series character in that genre who is so compelling people will be waiting for your next book. Readers who come late to the series go back to read earlier books, and so sales take on a life of their own, each book helping to sell the others. This was a painful lesson, because I did not do that. Each of my books is a stand-alone novel without a series character, and each straddles a shadowy line between genres. Instead of a series that helps promote me and my oeuvre, I have to start over each time a new book is published, promoting each book individually. 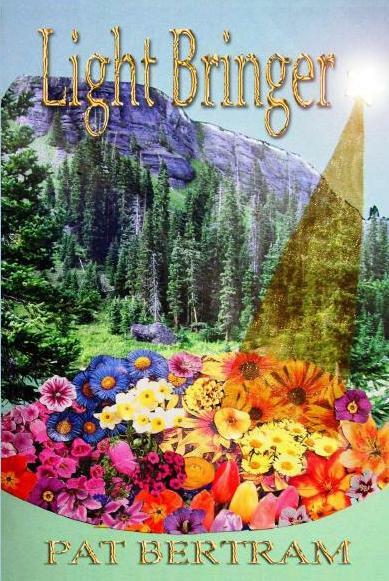 My latest novel, Light Bringer, has just been published, and I’ve been spending the past few days updating sites and blogs. Still haven’t gotten around to my website yet — it takes about ten times longer than I ever plan for. The only reason I’m telling you this is that I’d planned to write a great article about the themes of the book, perhaps talk about the plays of light in the novel, but that would take work, and I’m ready to play. So, let’s play! Just click on the image. Celebrating Four New Releases from Second Wind Publishing! To celebrate these releases, we have three contests/giveaways/chances to win books. Choose your favorite, or enter all of them! All events end on April 15, 2011, so hurry!! 1. a writing contest: If you could write a letter and send it back through time to yourself, at age eight, what would you say to your younger self? J. Conrad Guest will select the best ones and award those letter writers inscribed copies of One Hot January. Click here for the rules and to submit your entry: What Would You Say to Your Eight-Year-Old Self? 2. a quiz: One person, randomly chosen from all correct entries, will win an ecopy of all four newly released books. (To be downloaded at Smashwords.com). Click here for the quiz: Take this Quiz and Win Books! 3. a giveaway: leave a comment on this post telling us which newly released book (or books) you would like to read, and you might win that ebook! Four people chosen at random from all commenters will win an ebook of their choice to be downloaded from Smashwords in their preferred format. 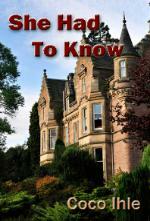 More Than a Governess: Becky Thorn has been keeping a secret for more than seven years. A secret that, if found out, could destroy her. So before she gets too ensconced in London society, she accepts a position as a governess for a reclusive Viscount and his wife, far away from the ton. Read the first chapters of these books at: The Exciting Worlds of Second Wind Books. For even more fun, click on the covers and you will find a surprise! Take this Quiz and Win Books! If you don’t know the answers to the following questions, (or don’t want to guess) you can find most but not all of the answers by clicking on the above links. One person, randomly chosen from all correct entries, will win an ecopy of all four books. 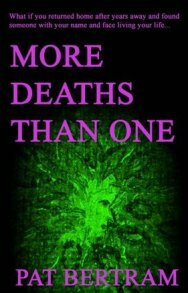 (To be downloaded at Smashwords.com). Send your responses to secondwindpublishing@gmail.com before April 15, 2011 to be considered for this special prize. Hint: five questions pertain to each book. This book has been described as the world’s longest parable. The main character of this book is a Midwestern college history professor. This story takes place in London. This book is about getting a second chance at starting over. 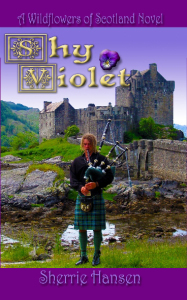 One of the main characters in this book is short of time and short of patience. This book features a ghost cat. Or is something other than a ghost? This book is a regency romance. This story takes place in Colorado. The stolen object in this story could have repercussions for the Catholic Church. This is the fourth novel by this author to be published by Second Wind Publishing. 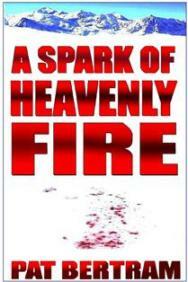 This book is written in the style of Raymond Chandler. This book is best described as speculative fiction. This story is about the theft of a famous relic. This book takes place in alternate realities and features time travel. This story takes place in New York. 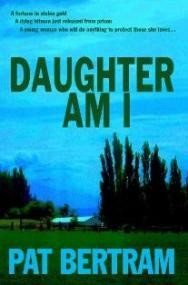 This is the first book by this author to be published by Second Wind Publishing. This story takes place in Italy. This book is part of a published series. The heroine of this story is a servant. Or is she?